Rigel Medical analysers have been specified for a ground breaking project in South Africa designed to improve standards of medical device safety and performance inspection. 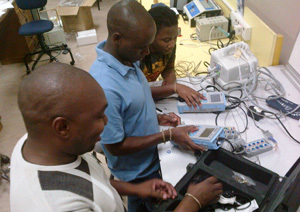 The Rigel 288 electrical safety analyser, Uni-Pulse defibrillator analyser and Uni-Sim - the first all in one vital signs simulator - are among several precision testers being used by the National Department of Health in Pretoria for its health technology audit and asset management scheme. This aims to create seven teams of highly trained technicians and equip them with the skills required to understand better the importance of electrical safety testing and how to service and maintain medical equipment properly. Once qualified, they will be embarking on a programme of safety and performance inspections of biomedical equipment using the Rigel instruments. The move will improve national safety testing procedures, ensuring more electrically operated equipment such as x-ray machines, ECGs and blood pressure units used at healthcare and hospital facilities throughout South Africa are safe for use by both medical staff and patients. Rigel Uni-Therm (formerly the 377) electro surgical analyser and Med-eBase PC database software, which provides enhanced electronic recording and management of testing programmes, are also being used to improve the technicians’ skills. Ms Ncumisa Ndlovu, director - health technology management from the Department of Health - MP said the Rigel testers offered more advanced features and high specification that meet the department requirements. “Using the combination of Rigel equipment will ensure our technicians are properly trained and can carry out testing work much easier. Laurent Olive, Rigel’s EMEA manager, said: “We’re delighted to be able to support the Department of Health and wish the project well. The 288, Uni-Pulse, Uni-Sim, Uni-Therm and Med-eBase are all part of a comprehensive range of high performance specialist biomedical test equipment supplied by Rigel Medical, part of the Seaward Group.